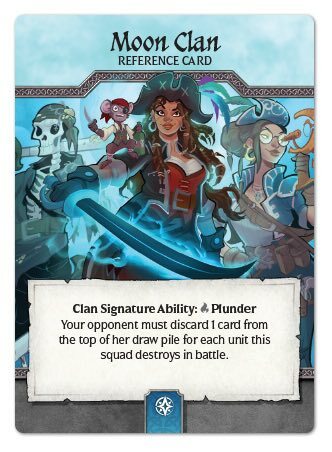 Crystal Clans Preview: Plundering Pirates! 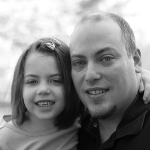 Arrrr, ye landlubbers have been clamoring for more clans. Well thank ye lucky starrrrs, because I’m back! And accompanying me is the Moon Clan. And if me subtle opening didn’t give it away, the Moon Clan is full of plundering pirates. The Moon Clan has one of my favorite signature abilities, and let’s not even talk about how I feel when I have to play against this crew. When battling with a lead unit that has Plunder, your opponent must discard 1 card for every unit you destroy. Squads with frail units need to be on high alert when a pirate steps onto the battlefield. The Moon Clan is led by the fearsome Captain Blacksaber. In addition to being able to Plunder an opponent’s deck, her Pirate Grit also grants 2 defense to every pirate unit on the battlefield. A squad of 3 pirate units effectively can have another 6 defense. It’s a great way to keep the Plundering going. The Raiders are a fast moving bunch with a high defense. They pack a light punch, but they’ll leave your vaults bare. 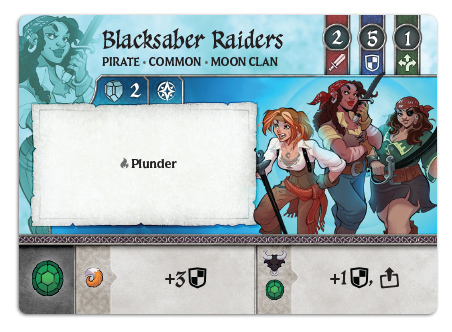 While it may be difficult to execute a Plunder with only 2 attack, the Blacksaber Raiders are great units for leading a raid. Their toughness keeps them on the battlefield, and protects other units who will can deal the damage. 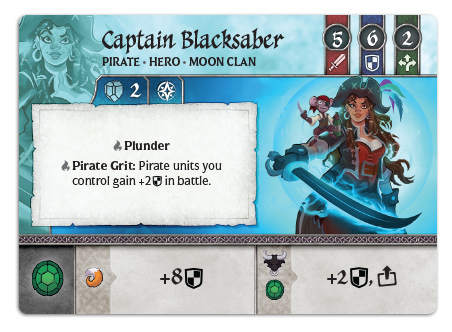 And if the Raiders are combined with Captain Blacksaber, your opponent will really struggle to gain control of the high seas. When I’m playing against the Moon Clan, no unit terrifies me as much as the Cannoneers. 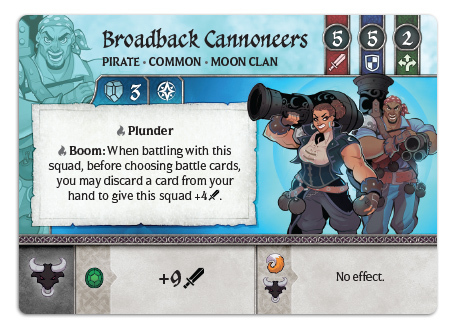 They have great stats, and Boom allows a single Cannoneers unit to destroy most anyone straight away for the small cost of a single card. But the scariest thing about them might just be their battle effect; it’s a boom or bust strategy to potentially add 9 attack to a battle. But its real strength lies in its ability to influence an opponent’s choice of battle card. When I play against the Moon Clan, I’m very nervous about playing a Turtle (Guarded) battle card until I know these cards are out of the way. Not all pirates are beefy fighters though. The Moondust Engineers use their ingenuity to outfit the clan with improved gear. Much like Blacksaber’s Pirate Grit, this ability applies directly to all pirate units. 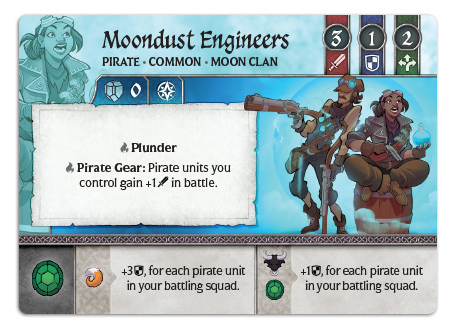 Even cooler, perhaps, is that if you had multiple engineers leading their respective squads, they would each contribute their gear to all pirate units on the battlefield. It’s a bit difficult to set up, but can certainly create some of the nastiest squads you’ve ever seen. In the next preview, we’ll get a chance to meet the Gem Clan.